Personally, forty years, but we've had the business in the area since 2000 when we took over the garage in Wellesley Avenue. It was built as the village garage in the 1930s. Under that forecourt are what were fuel tanks, all since cleaned out. We spent quite a lot of money sorting it out but leaving its character. Before that, it was the kind of place where you wiped your feet, on the way out. That building holds 22 cars and was half devoted to sales and half to servicing. By 08/09, we ran out of space. A client of ours who's a jeweller said, I understand the problem; if I want to double the size of my business I just buy another safe. With cars you need a new premises. We were regularly finding ourselves with 25 cars on board and room for 22 we we're stacked, parking them outside during the day and getting tickets. It was turning into a bit of a nightmare. So when the opportunity came to take over the premises in Goldhawk Road we thought, that would solve our problem because it's 300 yards from the workshop. Although at that time we were deep in recession and recessions do affect us. We decided to fight recession with expansion. That was brave. Did you feel brave? Yes. You just don't know how deep it's going to get. My only barometer is that I'm over 60 now and I've been through two or three recessions before. As I said to our then bank manager, the one advantage I have over you, Mr. Bank Manger, is I know that somehow or another, we do get through them. So, you have to trust your instincts with these things. We acquired the showroom and because I'm a believer in this area, not just because of its geographic relationship to the West End and the accessibility to Heathrow, because we have a number of international clients, the accessibility off the A4, the A40, the A3 is easy: it's a brilliant location. The street could be improved and there are improvements going on at the moment, which is nice to see. One gets the impression that it's on the up. So, we took the showrooms on and spent quite a lot of money re-glazing the front and doing a lot of alterations inside, making it presentable. And of course, we've wanted to do this to a standard acceptable to owners of classic Aston Martins. We are Heritage representatives with Aston Martin and wanted to create a space reflecting that. What is their Heritage side? Aston Martin recognised many years ago the importance of the heritage of the brand even to the sales of modern cars and committed to continue the supply of parts and technical support for all of the older cars. When I left school I worked for two years at Henley's in Hendon, the largest Jaguar dealership in the country. I started in a boiler suit as a fitter's mate on the workshop floor. In 1974, I took a job with HR Owen in South Kensington as a junior salesman selling Rolls, Bentley, Ferrari, Jaguar... Aston Martin was in dire trouble then, in receivership. 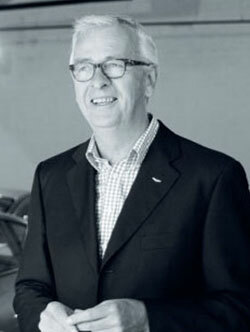 My then sales manager at HR Owen took the job of Sales Director at Aston in 76 and he shortly after recruited me. He doubled my salary so I had to say yes. I went to work for Aston's and remained there and in 1984, I took over from him on his retirement and ran the London sales until 1991, when Ford Motor Company took a large stake in Aston Martin. We were also in one of those recessions. The then CEO resigned in late 91 and shortly after I left and started my own business as a sole trader in Aston Martins and classic cars. Does everyone who buys an Aston Martin want to be James Bond? No, not really. The exposure of the Aston Martin brand through Bond is massive, but what's terribly interesting is that Eon Productions, the producers, take an awful lot of money from brands for being in their films – what we think of as product placement. Omega will probably pay many millions to have their watch in the Bond films. Heineken too. I have a very vivid memory from the world premiere of 'Skyfall' shown at the Royal Albert Hall in front of HRH Prince Charles. Everyone was there, the great and good, red carpet et cetera. The curtain goes up and the film starts. Tick, there's the shot of the Omega... Tick, there’s the scene with Bond drinking a Heineken. But the scene where Daniel Craig pulls back the garage doors to reveal the DB5, well the audience went quiet... and then there was a round of applause. I kid you not, there were wolf whistles... I think the producers probably understand that a Bond film’s not a Bond film without an Aston Martin. Did you see Daniel Craig's ad for Range Rover? Money talks. I don't think there's any lack of good will between Daniel Craig and Aston Martin and Eon. It seems to me, a special relationship which benefits everyone, a win-win if you like. It's great but Aston Martin and Bond nearly never happened. Aston were very reluctant to give them a car in 1964. The filmmakers nearly ended up with an E-type Jaguar. You have cars on your website priced at £295,000. What's the most valuable car you've ever sold? Monetary value, just under two million. It sounds very dramatic when you use these big numbers but the fact is, quite a lot of important or low volume grand marque classic cars, are a million pounds and more. One 1960s Ferrari recently sold in California for thirty or forty million dollars. These are automotive works of art. They're no different from a Damien Hirst. Most of the cars you see here are extremely low volume cars made by artisans and craftsmen that were designed and penned before the age of legislation, which said the bumpers have to be this height and the lights and mirrors have to be over there and that big. These are pure designs, not legislator's designs. These cars have a sense of beauty which can be appreciated for what they are, automotive art that have the potential to be an automotive Hirst, a Warhol or a Hockney. Why do you think some men are so into cars? I remember watching an Alan Whicker programme in the 70s and he was with a successful businessman and landowner in Australia. And this chap used to charge around in a pre-war Bentley. And Alan Whicker said, I see that you have a thirty-year-old car. And the guy said, I love old cars. I consider this pre-war Bentley more than a work of art because I can sit in it, I can smell it, I can hear it and I can get a sensation out of driving it. I feel an attachment to it and I can never do that with a painting. The answer is: cars are exciting. Can you sense a wealthy person? That's a game I gave up guessing years ago. These days, you have to assume everyone is credible until they prove themselves incredible. That's the way a retailer should behave in any case. We have one particular client who's internationally based, has homes everywhere and a collection of cars in London that easily equates to a million pounds or more, if you saw this man in the street you might think he's a vagrant. Will classic cars be worthless when we run out of oil? No, no, no. And the reason is we won't completely run out of oil. It will just get harder to find and more expensive. Interestingly, the consumption of oil globally is going down at the moment. I'm sure someone will invent a substitute for petrol. You can run a car already with LPG. Prince Charles had his DB6 Volante made to run on old wine. Like all good drivers, no. What will we Londoners be driving in 20 years? We're five minutes away from the Google car. I'm going to pick up my iPhone, I'm going to hit the app, a cabin on wheels will arrive at my door, and this thing's going to drive me off guided via satellite down special lanes in the road which will be paid for by the motorist incidentally and it's going to deliver me at my destination and I'm going to be charged on my phone bill. It's all good news for people who own old cars though, because they're still going to want to enjoy themselves at the weekend and there lots of new events being organised by clubs these days. Thank you, Nicholas. It's been a real pleasure to meet you.